Foster children will now have the choice to remain in foster homes till age 21 or move out at 18 with federal assistance. 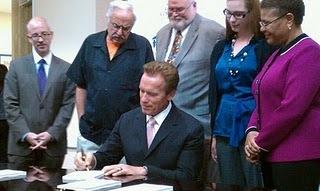 The California Fostering Connections to Success Act, signed by Gov. Schwarzenegger on Sept. 30 has made this possible for thousands of foster youth who under current law are legally emancipated without state support at age 18. The legislation, also known as Assembly Bill 12, will be effective January 2012 and will require youth to attend school, college, career oriented programs or work a minimum of 80 hours a month in order to receive funding. The bill also provides transitional housing support to those who qualify until age 21. San Francisco had an estimated 189 foster children emancipated within the last year according the database of the California Department of Social Services and the University of California at Berkeley. California had a total of 63,553 foster youth last year of which 5,332 were emancipated. SF State communications major and former Guardian Scholar, Jewel Boone, 19, said statistics provide data on the number of kids in foster care, but does not provide information on how it impacts them directly. “Identity issues of not knowing who you are is a psychological task and a big responsibility for children and young adults,” Boone said. She still considers herself “one of the few lucky enough to have a strong family support system.” She said a lot of her friends in the foster care system did not have that. “A friend of mine was kicked out at 11:58 p.m on his 18th birthday along with a bag that had all his things in it,” she said. Boone credits the Guardian Scholars program at SF State for supporting people like herself. Wexler said the real problem is children being placed into foster care when they don’t need to be. “Poverty, neglect, and housing for homeless parents separate children from their families, which could simply be solved by providing decent housing and daycare centers for single parents,” he said.